Dave’s strategic and practical approach to improving the efficiency and effectiveness of inside sales teams is second-to-none. DiscoverOrg, the leader in high-quality sales intelligence, announced today that AA-ISP recognized David Sill, as part of the AA-ISP Leadership Summit 2016, at an awards banquet held on April 21st at the Hyatt Regency O’Hare in Chicago, Ill.
Sill joined DiscoverOrg in September 2015 as the company’s SVP of Customer Success. Since then, he has restructured the customer success organization, dramatically increased customerthe retention rate, and initiated the organization’s educational services arm. In June, Sill plans to launch a Sales Development certification program for DiscoverOrg customers with practical tips, digestible content, and “challenges” aimed at improving SDR performance. 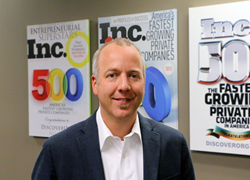 Prior to joining DiscoverOrg, Sill was the director of inside sales for Zyme Solutions, where he launched the company’s first inside sales function. Sill has also worked for PC Helps Support, Inc. (now know as Vitalyst), where he was a DiscoverOrg customer. In this role, he built a sales engine that posted 14 consecutive years of high-margin and YoY revenue growth from inside sales. Sill was previously named to the TOP 25 Most Influential Inside Sales Professionals in 2011. A complete list of companies and individuals recognized by the AA-ISP will be published on the AA-ISP website, go to http://www.aa-isp.org. DiscoverOrg will be hosting the Portland AA-ISP chapter networking event this month on Tuesday, May 10 from 6-8 pm, at 10 Barrell in the Pearl District. David Sill will be the featured guest.